Milan 2011: Italian brand Superego editions present a collection of ceramic vases resembling tree branches by Italian designer Andrea Branzi in Milan this week. All designed by the famous italian designer Andrea Branzi. Bosco collection continues the domestic architectures concept, started with the preceding series Enzimi and Portali. Fascinated by Ikebana Japanese floreal discipline, Branzi creates domestic laris made to expose flowers, silent altars destined to the celebration of secular cults. 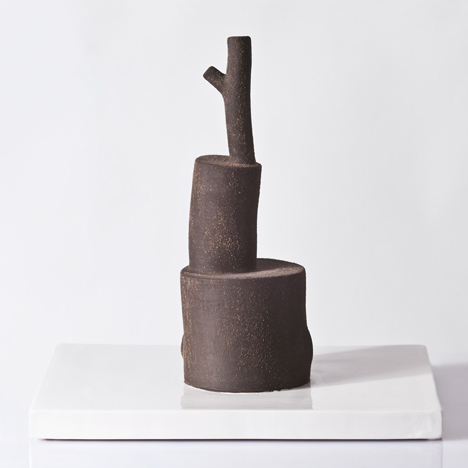 Bosco series emphasize the natural inspiration: sprigs, trunks, tree fragments realized in ceramics almost assume an animist value, like they were our domestic deities. Andrea Branzi is designer, architect, teacher. Like design theorist and ideologist he has produced numerous writings and publications, directed Modo magazine, won three times Compasso d’oro prize. His objects in limited editions for Superego testify his attention for the excellent Italian craftsmanship, the only one able to produce small series of objects, valuable for the conceptual innovation and refined technical manuality.